During summer vacation all the brothers and sisters and cousins of one large family come to stay together at a big house by the shore. Each morning Grandpa wakes the sleepy children to go clam digging. Each day they return with hardly any clams at all. 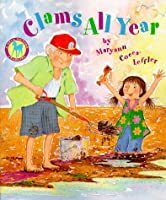 But one day after a big storm they go down to the beach and discover a big surprise--a bumper crop of clams that will last all year long.